Stare long enough across a broad tropical landscape and you can start to envision how exposure to the elements and geologic processes have carved out the patterns visible there today. I find that once I start considering a landscape, it is impossible not to wonder about how those long-term processes have affected the ecosystems that these landforms support. This interest is in large part what drew me to work in Greg Asner’s group at the Carnegie Institution for Science for my thesis, the final chapter of which was recently published in Ecology Letters. Greg runs the Carnegie Airborne Observatory (CAO) program, which collects landscape level remote sensing data across the globe, including in the lowland Peruvian Amazon over the Los Amigos Conservation Concession, where we conducted this study. I first visited the field station at Los Amigos in December 2012 with Greg and that is when the idea for this study was born. I had conducted preliminary analyses which indicated some remotely measured spectral characteristics of tree canopies varied along hillslopes, and so we went to the field to check out what we could tell on the ground. 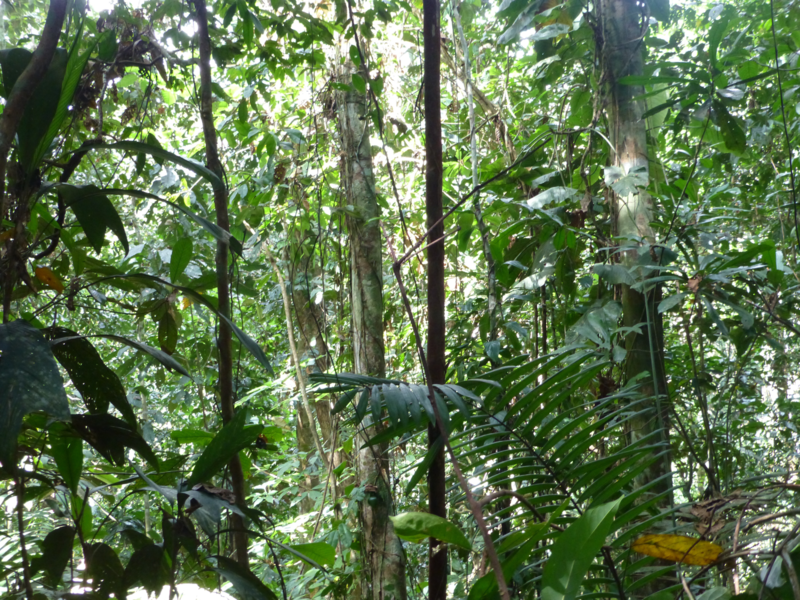 However, as anyone who works in these systems knows, tropical forests can be incredibly complex and difficult to understand from the ground – the perspective we get there is like what you see in this picture. This is why coupling airborne remote sensing with on-the-ground field work was so powerful for gaining insight into this system. I wanted to understand if streams that were etching hillslopes into old terrace deposits were introducing a new source of rock derived nutrients from deeper in the terrace into both soils and altering canopy characteristics, as well as simply sculpting the land surface. 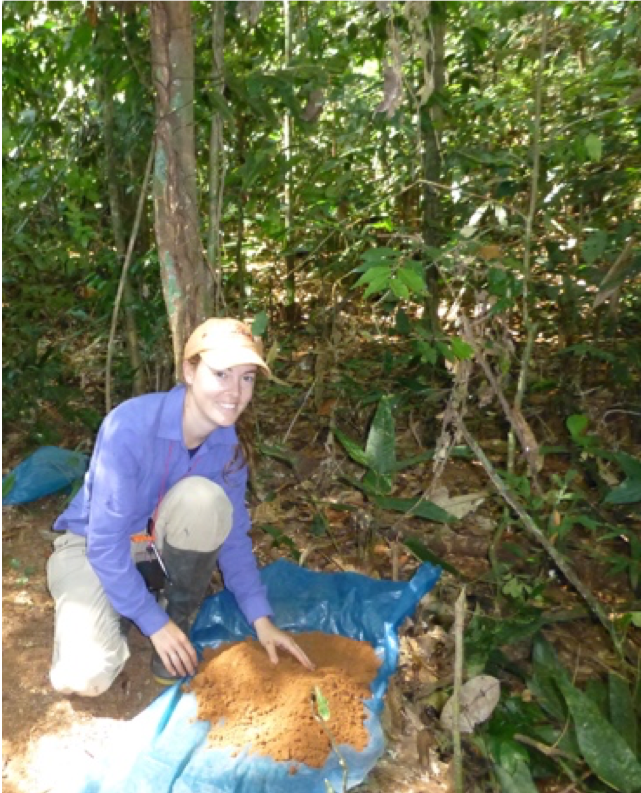 This is an aspect of nutrient cycling that had not yet been explored at a landscape-scale, and to do so would aid our understanding of nutrient cycling in the western Amazonian forests. This is especially significant as most forests in western Amazonia occur on terrace formations, which have lost much of the rock derived nutrient content in their surface soils over thousands of years of heavy rainfall leaching them away. Under these conditions it is often assumed that phosphorus acts to limit ecosystem processes, but we wanted to explore a wider range of rock derived nutrients that may be in low supply, including calcium. Based on our initial field explorations, we decided to collect soil samples across the landscape to get an understanding of how eroding hillslopes control soil nutrient distributions and if fresh rock derived nutrients were being introduced to the system. We used the high-resolution ground digital elevation models from the CAO laser scanner to identify hillslopes for sampling and then went out into the field and collected the soils. These samples helped us to determine that erosion from downcutting streams was leading to fresh sediment being exposed near the base of the hillslope, adding new nutrients to the ecosystem. To gain a larger-scale perspective, we also wanted to link what we learned from the soils with how forest canopy characteristics were changing across hillslopes. To do this we used maps of canopy nutrients, including foliar calcium and phosphorus concentration, that we generated from the CAO’s visible to shortwave infrared (VSWIR) imaging spectrometer.The VSWIR data had to be matched to field leaf collections to map out canopy characteristics, which were collected by an amazing team of expert Carnegie tree climbers and botanists using the Spectranomics methodology as part of their Peru-wide sampling effort. These maps were what allowed us to understand the general trends in the distributions of canopy foliar characteristics across the landscape. With our newfound ability to characterize how soil nutrients and canopy foliar characteristics varied across the landscape, we could analyze how these features vary across hillslopes within LACC. We found that canopy nutrients were arranged across the landscape in accordance with increased nutrient availability in areas where fresh sediment exposed through the processes of landscape evolution. This was especially true for calcium, an essential nutrient that is highly depleted in the soils throughout lowland Amazonian ecosystems. This was exciting because calcium is often overlooked as an important nutrient to ecosystem functioning. Our findings suggest that calcium is limiting ecosystem processes due to its low supply across the landscape, and that phosphorus and magnesium are being added back to the ecosystem through the process of erosion and landscape evolution.